Above, a photo that I snapped of the inside cover of Victuals the day it arrived at my doorstep– I wanted to share the beauty of this book the minute I saw it. 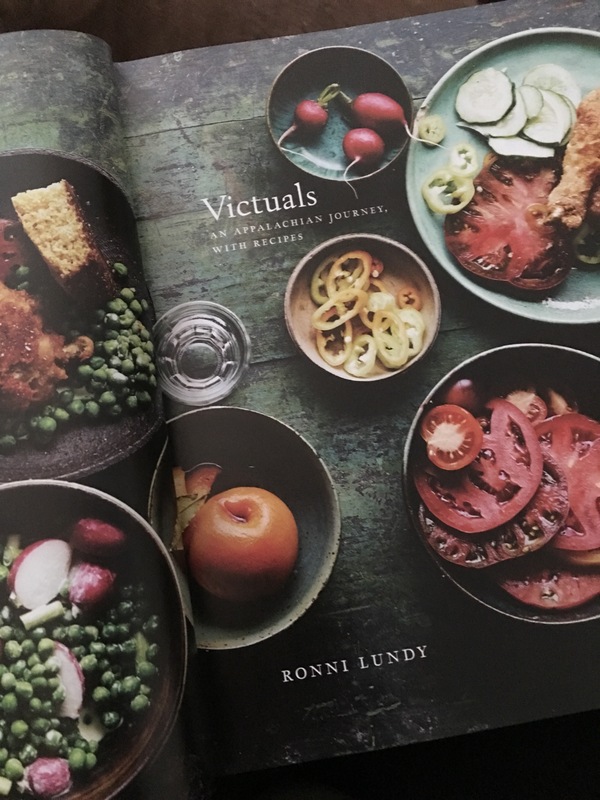 Ronnie Lundy’s Victuals (pronounced “Vittles”) is a chronicle of a 4000+ mile journey through Appalachia, a story and a history told through food. It’s part cookbook, part edible atlas. It winds its way through Tennessee, Virginia, Kentucky, and North Carolina, and pays homage to the traditions of Europe, West Africa, and the pre-colonial Americas that come together in the food of the Mountain South. It’s a book filled with seasonal and regional recipes, but also a history of the land and the people of Appalachia. Victuals reflects a confluence of climate, culture, industry, and ethnic heritage. Personal history also plays a huge part in this book. Ronnie Lundy grew up in Appalachia. She vividly remembers her “summers up home” in Kentucky, and recipes like the swing shift steak come directly from her childhood. There are recipes for every season. There are recipes for bright vegetable sides and hearty meat-centric suppers. There are recipes for sweet desserts and salty snacks alike. There’s a roasted root vegetable salad that comes dressed with bacon and orange soghum vinegar. Kale potato cakes, spring ramp pot roast, miner’s goulash, and a speckled butter bean cassoulet with rabbit confit. A simple skillet cornbread, a luscious buttermilk brown sugar pie, salty cheese nabs, and the sweet-and-savory banana pudding you’ll find below. There were also a few odd but delicious-sounding pickle recipes I put on my list for the spring– picked ramps and pickled green strawberries. The book is divided by key food groups and ingredients. Each section is devoted to a staple food– salt, corn, beans and apples, among others. The apple section is one of my favorites. It includes fried apples, cake, a sticky pudding, and a recipe for pork & kraut in cider gravy. To be honest, I had no idea the food of Appalachia was so varied. Staple foods pop up repeatedly, but there’s almost infinite variation in the preparation and addition of seasonal produce. And while this book digs deep into food traditions, the recipes are modern and fresh.